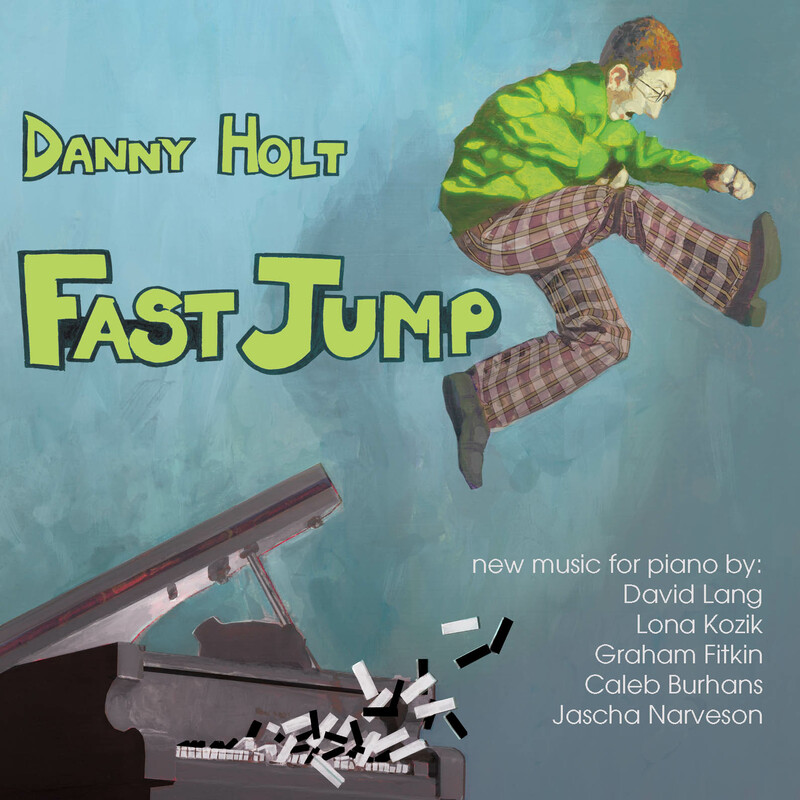 Danny Holt is a pianist who is genuinely obsessed with adventurous new music, and this disc captures him exploring that obsession with total abandon. Drawing inspiration from diverse sources, the music on Fast Jump delights in blurring boundaries and exploring sounds from a 21st century vantage point where Debussy, Philip Glass, and Harlem stride playfully commingle. At the center of the disc are two major new works for piano: memory pieces, by New York downtown legend and Pulitzer Prize-winning composer David Lang (of Bang on a Can), and Fast Jump by emerging American composer Lona Kozik. Ingeniously crafting incredibly direct expression out of small units of rhythmic and gestural material, Lang's memory pieces is an explosion of rhythm, process, color, and the juxtaposition of gentle subtlety and dazzling, aggressive sonic activity. Fast Jump, Kozik's set of etudes and interludes, is maddeningly virtuosic. With nods to Bartók, Debussy, Ligeti, and Glass, these pieces span the gamut from serene, impressionistic textures to aggressive fits of rhythmic energy, always with a keen sensitivity to rhythm and groove. The disc also includes Relent by British composer Graham Fitkin, a barrage of non-stop intensity from start to finish. Works by Canadian composer Jascha Narveson and New York based Caleb Burhans round out the album. Danny Holt performs across the globe in concert halls, clubs, art galleries, churches, living rooms, and wherever else he can find a piano and someone to listen. Known for his no-holds-barred style, he has been called “the classical music equivalent of an extreme sports athlete” (The Record, Waterloo, Ontario) and Los Angeles City Beat named him one of the “local heroes” of L.A.’s music scene. He specializes in performing contemporary works, 20th century music, and obscure and neglected repertoire from past centuries, often juxtaposing diverse styles to create unexpected sonic flavors. A specialist in contemporary music, he has held fellowships at the Bang On a Can Summer Music Institute, the Weill Music Institute at Carnegie Hall, and New England Conservatory’s Summer Institute for Contemporary Performance Practice, and he has worked with such composers as Steve Reich, Louis Andriessen, Christian Wolff, James Tenney, Graham Fitkin, David Lang, Michael Gordon, Augusta Read Thomas, and Michael Finnissy, among others. Holt has received awards and grants from ASCAP, Yamaha, the American Composers Forum, the Yvar Mikhashoff Trust for New Music, and others. A slender, cool chap named Danny Holt mastered the daylights out of it…a phenomenal performance. Meanwhile, among the local heroes, I would hazard the guess that the award for delivering the most notes-per-second among all recent virtuoso ventures might easily go to a slender chap named Danny Holt, who knocked ’em dead at the last Jacaranda concert with a performance of Heitor Villa-Lobos’ Rudepoema a couple of Saturdays ago...Danny Holt, composer, improv artist and phenom, turned this virtually unplayable piece into huge entertainment. Simply outstanding…The closing piece, British composer Graham Fitkin's Relent, in its U.S. premiere…brought the audience—who had shrieked, shouted and whistled after many of the numbers—to its feet. ... a brilliant player. A percussionist as well as a pianist, he attacks the instrument with verve. Danny Holt performs five works for solo piano that he claims to speak to him in a most primal way. The opener, Caleb Burhan’s In Time of Desperation is dedicated to Burhan’s father and Luciano Berio, who died in the year it was composed. The piece is more rock or pop piano than anything, beginning with a persistant ostinato and a repeated chord progression. The entrance of the melody is a tasteful drum set away from being something I could listen to endlessly. A similar groove is apparent in Graham Fitkin’s Relent, yet the choice of the highest register on the opening did not leave me wishing it would return once the melody drops. Relent is an uncompromising piece with an urgency and utter disregard for the performer. After 4 of the 11 minutes I was sweating out of sympathy for Holt. The repeated, telegraphic groups, threes and fours, are continually ascending and descending, creating swirling figures while accents reveal melodic material. David Lang’s Memory Pieces, like Jascha Narveson’s Ripple, allow Holt to deal strictly with textures and moods. While Narveson’s piece juxtaposes sweet, legato melodies over abrupt, stopped bass notes, Lang’s pieces all function as musical vignettes. ‘Cage’, like many of the eight pieces, uses reverb, but also simulates the effect through composition. ‘Wed’ stumbles in its execution deliberately, as if the performer had not yet learned the piece entirely. The work is a great addition to the program – all world premiere recordings – and offers a simplicity, subtlety, and tenderness to the listener. Danny Holt is a performing artist who takes great care in packaging likable music to timid audiences. He is not a secluded genius tinkering at horrible noises for a possible alien future where people will learn to love horrible noises...He is wild & fun, & his taste always steers him towards music that can showcase his playful playing & deepest emotions. Style, tho, is what really sets him apart from other "emerging concert pianists" - his background in percussion and composition has left him with superior skills at playing difficult rhythms with precision, & everything always with crisp cleanliness. ...Everything about Mr Holt's approach to classical piano music is alive - his composers are alive and paying attention, his playing is full of life, and his audience is awake.